May is Mountains-to-Sea Trail (MST) Month, a time to celebrate this 1,150-mile work-in-progress pedestrian perambulation of North Carolina. But with so many great stretches of hiking trails to choose from, how – and where – should we mark the month? I’ve hiked nearly all of the currently completed Mountains-to-Sea Trails (about 672 miles) and choosing a favorite trail is a vexing dilemma. With the caveat that all sections deserve to be celebrated, I’ve nonetheless picked five day-hikes that, for various reasons, you won’t regret hiking. This section of the Mountains-to-Sea Trail piggybacks on the well-known Tanawha Trail that explores 13 miles of the southeast-facing flank of Grandfather Mountain. It’s rocky and rugged at first (the climbs, however, are short), passing under the Linn Cove Viaduct, through tight tunnels of rhododendron and over mountain creeks on artfully-designed bridges. The highlight: views from atop Rough Ridge, a rocky knob poking out from a slope dominate by high-ground heath. This is one of the best hikes to experience the dizzying Blue Ridge escarpment, in part because the elevation gains and losses are short. 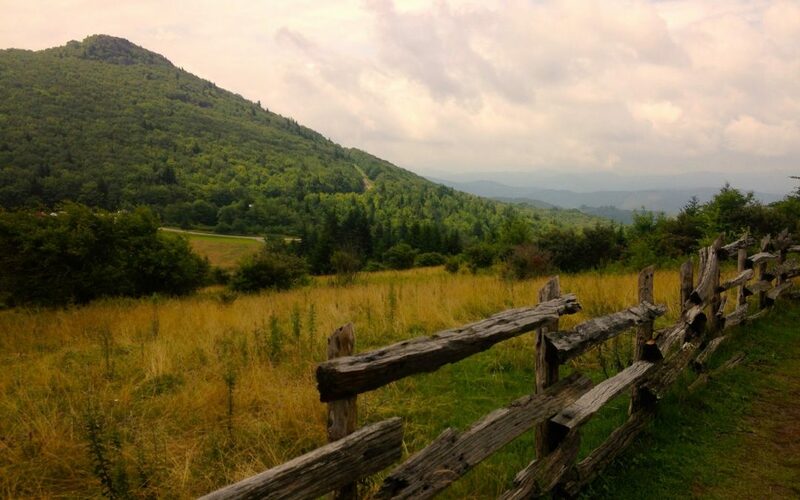 You’ll find easy access and shuttling along the Blue Ridge Parkway. Find out more about this trail. This hike begins just outside the eastern border of Middle Prong, from a gravel roadside parking area off NC 215. Head east on the Mountains-to-Sea Trail and head through rock outcrops, a spruce forest, a clearing with expansive views, and creeks. For all the ecological variety the trail traverses, there’s surprisingly little elevation change (unless you opt to take a side trip up to 6,214-foot Black Balsam Knob). 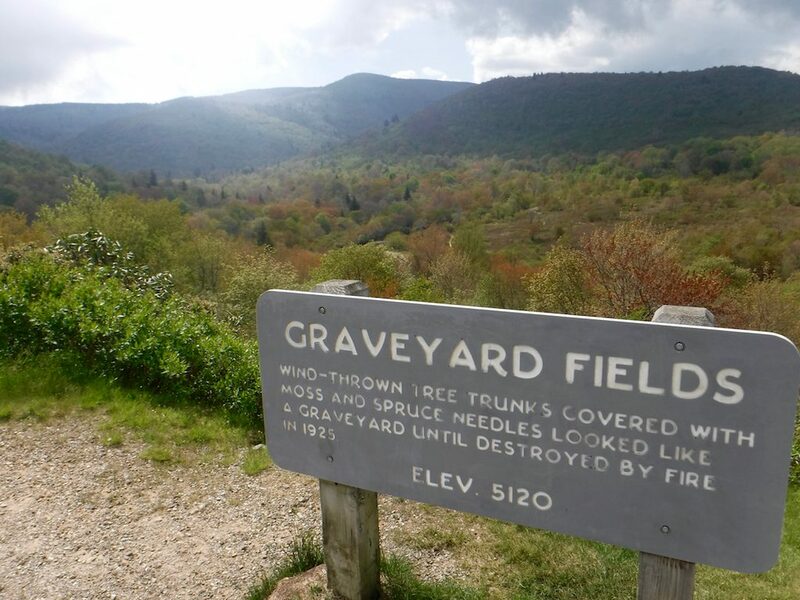 The finish is in the Graveyard Fields area, where severe fires a century ago have left the terrain largely devoid of trees. Check out Yellowstone Prong and Falls just before climbing to the Graveyard Fields parking area. Again you’ll find easy shuttle along the Blue Ridge Parkway. Find out more about this trail in the Friends of the MST Trail Guide, Segment 2 (starts at mile 40.6 on Page 10 and continues to mile 47.8 on Page 15). 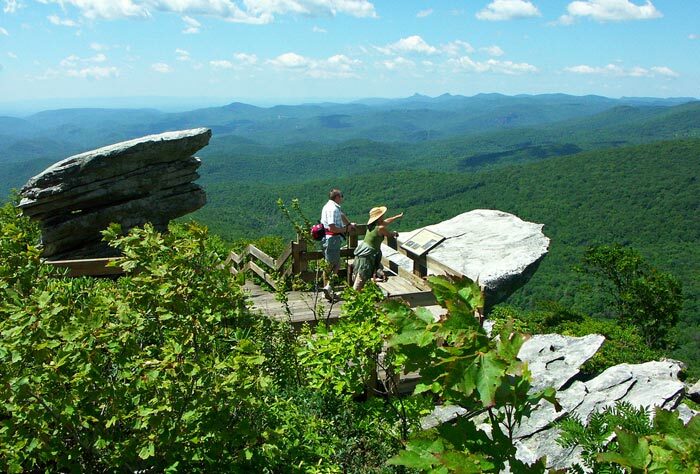 Live in the Triad and want a taste of the mountains without having to drive to the mountains? 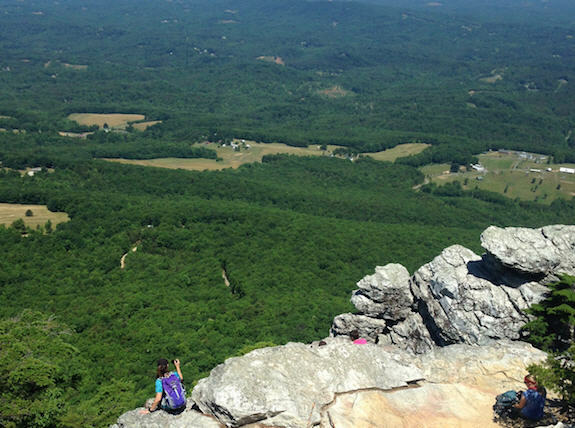 Hanging Rock State Park, about an hour north of Greensboro has everything you’d want in a mountain hike on its stretch of the MST: a whopping climb up to Moore’s Knob, 360-degree views, waterfalls, rhododendron, galax and more. The 8.7-mile stretch of the Mountains-to-Sea Trail running through the park exposes you to all that, but as a day hike the shuttle logistics are cumbersome. Rather, get a taste of the trail by starting at the Visitor Center and taking the 4.2-mile Moore’s Wall Loop Trail, which brings you back to the start. Then, regroup and head east on the Indian Creek Trail for less than a mile for a peek at two picturesque waterfalls. Find out more about this trail in the Friends of the Mountains-to-Sea Trail Guide, Segment 7 and Segment 8. If it sounds like I’m waffling on the difficulty, I am. 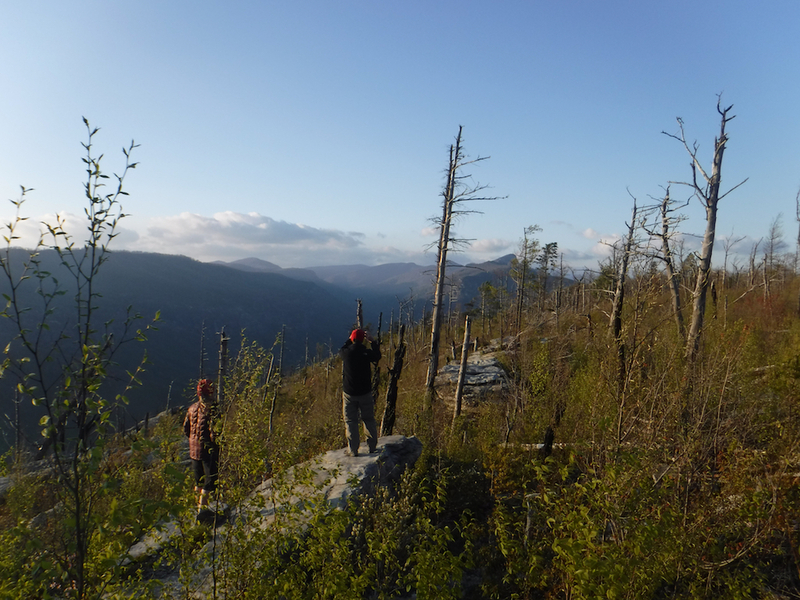 On a strictly point-to-point basis, this stretch begins at the Linville River and runs 8.8 miles east, starting with a good climb up Shortoff Mountain and an even better climb (kick-steps) up to The Chimneys. Top it off with another hardy climb up Table Rock. That’s the strenuous version. Turn your visit to moderate by starting at the Wolf Rock Road trailhead and doing all your climbing in the first mile, up to Shortoff. There, enjoy the best views of the gorge and a western landscape of rock and scrub for another three miles. Once you hit the rapid descent, turn and head back. It’s still about 8 miles, but a much flatter 8 miles. Find out more about this trail in the Friends of the Mountains-to-Sea Trail Guide, Segment 8, Page 22 beginning at mile 36.8 and ending on Page 23 at mile 45.6. Here’s a mighty fun stretch. Start at the remnants of a recently decommissioned dam, then duck briefly under Pleasant Green Road (there’s an overpass), then climb a bluff borrowed from the Southern Appalachians, with mountain laurel and rhododendron clinging to rocky cliffs. Pass through a pine forest, then enter a floodplain for an encounter with the forbidden fruit of the Triangle: the Eno Quarry. 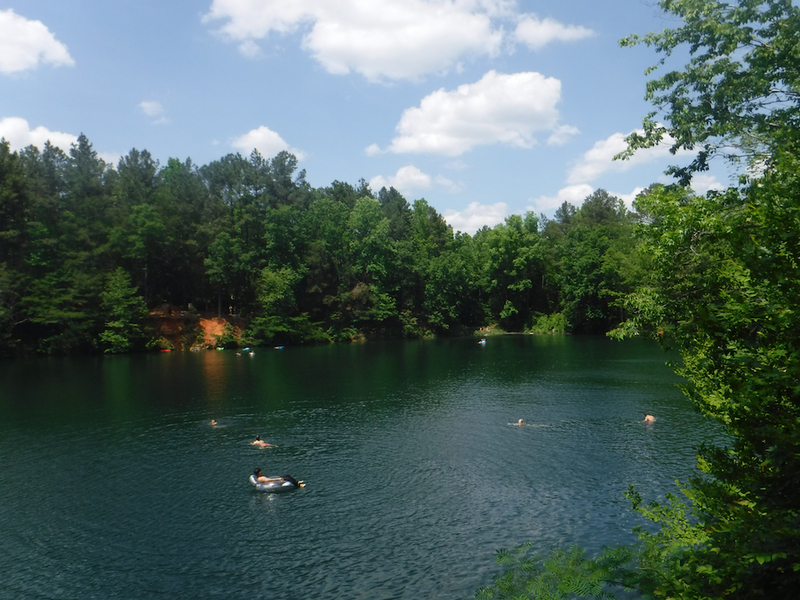 Technically, it’s swimming that is forbidden in the spring-fed waters of this 4-acre lake. Enjoy the trail that loops around the quarry before returning the way you came.